Wabash College President Gregory D. Hess announced a $1.73 million grant from Lilly Endowment Inc. that will support the continued work of the Wabash Pastoral Leadership Program. The grant will enable Wabash to continue the program through 2019. The Wabash Pastoral Leadership Program identifies talented younger pastors with five to 10 years of ministry experience and works with them - on and off the Wabash College campus - to enhance their leadership abilities. Cohorts of 18 pastors participate in the program, meeting with civic leaders from Indiana and around the world to explore challenges facing local communities. In addition, the program includes domestic and international study tours. “We are grateful for the vote of confidence Lilly Endowment has given us to continue our work,” said Derek Nelson, program director for the Wabash program. “It is a great joy to be part of an effort to help pastors understand more deeply the challenges in their communities and how their churches can contribute to the strengthening of those communities. “We are pleased that several dozen more Indiana pastors will be able to benefit from the program and from their interactions with one another,” Nelson added. During the program, the pastors meet with influential civic leaders to discuss current efforts to strengthen education, economic development, public health, the administration of justice and other issues. “The conversations with Indiana’s civic thought-leaders spark the imagination of the young pastors and help them think about the mission of their churches, as well as the well-being of their communities, in adaptive, creative, passionate ways,” said Elizabeth Manning, associate director of the Wabash program. Since its launch in 2007, 68 pastors who serve congregations in 32 Indiana counties and represent 16 denominations have participated in the Wabash program. These pastors have engaged in conversations with nearly 200 influential leaders, including small-business owners, school superintendents, social service directors, judicial officers and hospital administrators, in order to understand the complexity of the challenges facing Indiana communities. At the end of the program clergy have more confidence and a larger vision of ministry, Manning said. They are better prepared to bring the resources of Christian thought and practice to help communities solve problems. In addition, the pastors are increasingly recognized as civic leaders who build bridges in their neighborhoods, towns and cities. 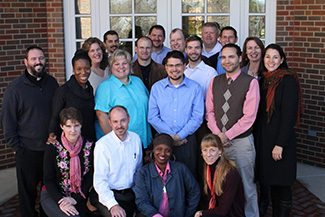 The Wabash Pastoral Leadership Program is part of a larger Lilly Endowment initiative to strengthen the professional development of early-career clergy. The Endowment funds 17 other programs across the United States in a variety of contexts and institutions to further this aim. Wabash College hosts a coordination effort to support mutual learning across the initiative. Wabash is the liberal arts college for men, whose mission is to educate its students to think critically, act responsibly, lead effectively, and live humanely. In addition to the Wabash Pastoral Leadership Program, Wabash is also home to the Lilly Endowment-funded Wabash Center for Teaching and Learning in Theology and Religion. For more information on the Pastoral Leadership Program, please click here. Click here to nominate a pastor for the Wabash Pastoral Leadership Program.